I once read a report of a man who struggled miles to vote in India’s first General Election. He arrived late. The polls were closed he was told. Undeterred the man begged and pleaded for his chance, and the official relented directing the man so he could make his mark in history. The honour of voting mattered. For so many for once people felt important. It speaks of a time when hope still inspired but the wounds of Partition were still fresh. Angry refugees from East and West Pakistan were not yet settled in their new homes. The Andhras in the south and the Sikhs in the north were getting restive. The Kashmir question was, in the eyes of the world, still unresolved. 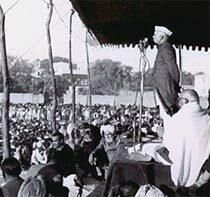 As the campaign commenced, Jawaharlal Nehru, had just survived a challenge to his leadership of Congress, but after Vallabhbhai Patel’s death he was both dominant figure and the target of all opposition. 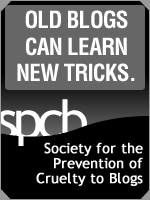 Independence had not as yet made any dent in the problems of poverty and inequality, and Congress may be held responsible. ‘MINISTERS FACE STIFF OPPOSITION’ read a headline from Uttar Pradesh. ‘CASTE RIVALRIES WEAKEN BIHAR CONGRESS’, read another. From the north-eastern region came this telling line: ‘AUTONOMY DEMAND IN MANIPUR’. From Gauhati came this one: ‘CONGRESS PROSPECTS IN ASSAM: IMPORTANCEOF MUSLIM AND TRIBAL VOTE’. Gwalior offered ‘DISCONTENT AMONG CONGRESSMEN: LIST OF NOMINEES CREATES WIDER SPLIT’. A Calcutta headline ran: ‘W. BENGAL CONGRESS CHIEF BOOED AT MEETING’ (the hecklers being refugees from East Pakistan). ‘NO HOPES OF FREE AND FAIR ELECTION’, started a story datelined Lucknow: this being the verdict of J. B. Kripalani, who claimed that state officials would rig the polls in favour of the ruling party. And the city of Bombay offered, at three different moments in the campaign, these more-or-less timeless headlines: ‘CONGRESS BANKS ON MUSLIM SUPPORT’; ‘CONGRESS APATHY TOWARDS SCHEDULED CASTES: CHARGES REITERATED BY DR AMBEDKAR’; and ‘FOURTEEN HURT IN CITY ELECTION CLASH’. But there was also the occasional headline that was of its time butemphatically not of ours -notably the one in the Searchlight of Patna which claimed: ‘PEACEFUL VOTING HOPED [FOR] IN BIHAR’. Elsewhere he deplored the ‘monster of casteism’. Congress was also a vote for its foreign policy of principled neutralism. He asked the women to cast off their purdahs and ‘come forward to build the country’. He admired some of his opponents, former colleagues, like Ambedkar, Kripalani, and Jayaprakash Narayan. ‘We want a number of [such] men with ability and integrity’, he said. ‘They are welcome. But all of them are pulling in different directions and doing nothing in the end’. 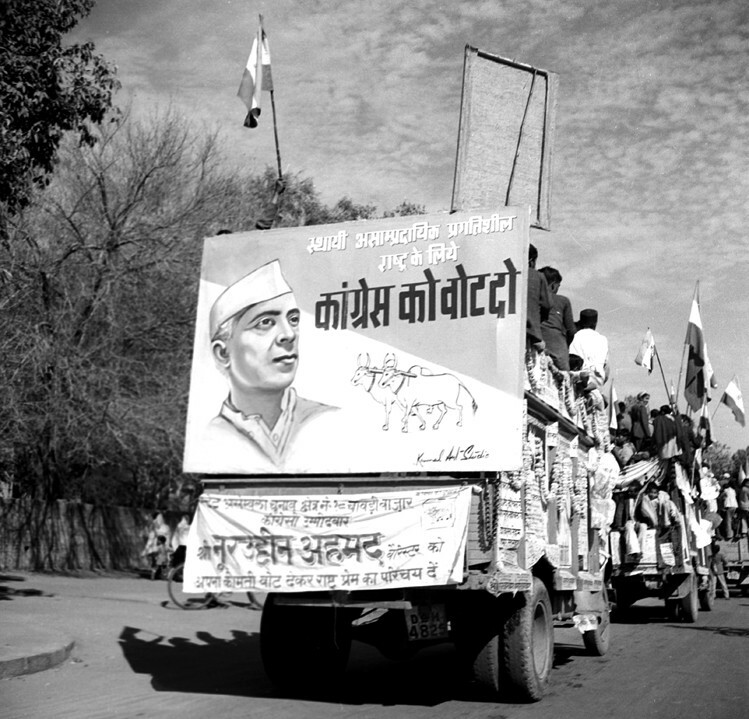 In the course of his campaign Nehru addressed 300 mass meetings and myriad way side ones. 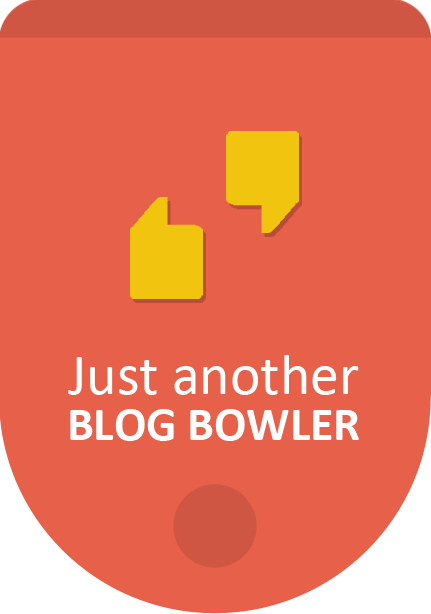 He spoke to about 20 million people directly, while an equal number merely had his darshan, eagerly flanking the roads to see him as his car whizzed past. Those who heard and saw Nehru included miners, peasants, pastoralists, factory workers and agricultural labourers. Women of all classes turned out in numbers for his meetings. Sometimes there was a sprinkling of hostiles among the crowd. 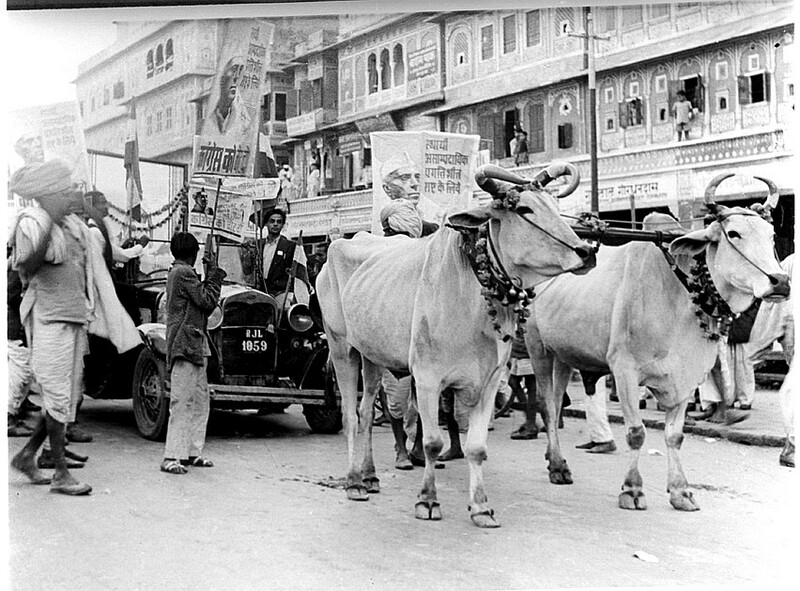 In parts of northern India Jana Sangh supporters shouted out at Nehru’s rallies that he was not to be trusted because he ate beef. Coming across a group of communists waving the hammer and sickle, Nehru asked them to ‘go and live in the country whose flag you are carrying’. ‘Why don t you go to New York and live with the Wall Street imperialists?’ they shot back. 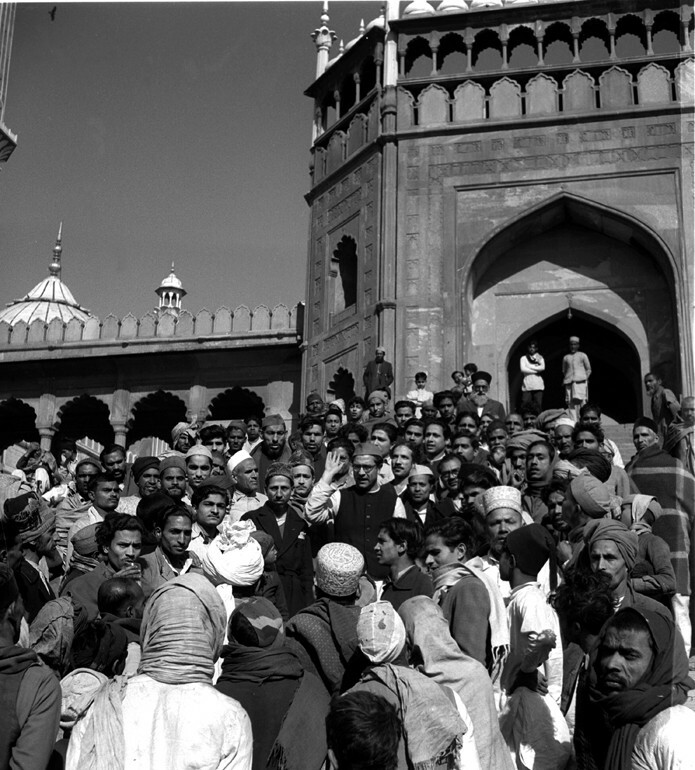 But for the most part the people who came to hear Nehru were sympathetic, and often adulatory. [At] almost every place, city, town, village or wayside halt, people had waited overnight to welcome the nation’s leader. Schools and shops closed: milkmaids and cowherds had taken a holiday; the kisan and his helpmate took a temporary respite from their dawn-to-dusk programme of hard work in field and home. In Nehru’s name, stocks of soda and lemonade sold out; even water became scarce . . . Special trains were run from out-of-the-way places to carry people to Nehru’s meetings, enthusiasts travelling not only on foot-boards but also on top of carriages. Scores of people fainted in milling crowds. Press reported on the popular mood. When Nehru spoke in Bombay, a procession, mainly of Muslims, marched to Chowpatty to the accompaniment of pipes and cymbals. It was headed by a pair of bullocks and a plough (the Congress symbol). 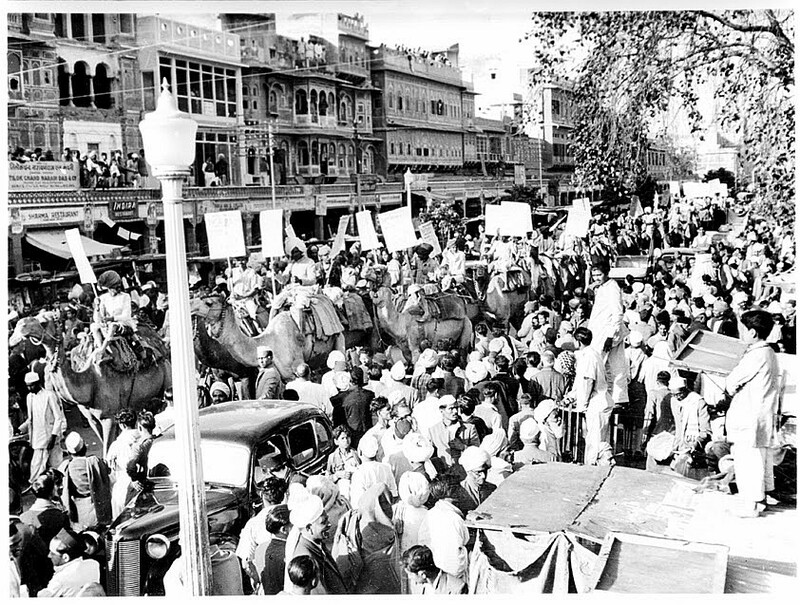 Everywhere, crowds started collecting from early morning for talks scheduled for the afternoon; almost everywhere, barricades were broken in ‘the enthusiasm to catch a glimpse of Mr Nehru’. After he finished his speech in Delhi, Nehru was met as he came off the dais by a famous wrestler, Massu Pahalwan, who offered him a gold chain and remarked, ‘This is only a token. I am prepared to give my life for you and the country. The media was much taken with a Telugu-speaking woman who went to listen to Nehru speak in the railway town of Kharagpur. As the prime minister lectured on she was consumed by labour pains. Immediately, a group of fellow Andhras made a ring around her: the baby was safely delivered, no doubt while the mid wives had an ear cocked to hear what their hero was saying. Negi, then 34, was India’s first ever volter. At 97 he voted in the 2014 elections. “Mujhe aaj bhi who din yaad hai. Woh khushi, woh garv (I still remember that day. The joy, the pride)” he said. 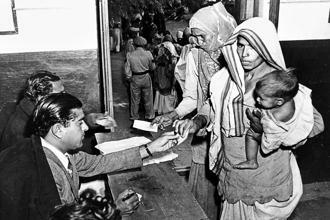 The first Indians to vote in a general election voted on 25 October 1951. They were a group of were a group of Buddhists in the tahsil of Chini in Himachal Pradesh, voting just days before the winter snows shut their valleys from the world. It was the same day that Winston Churchill returned to Office, ousting Labour in the UK General election. 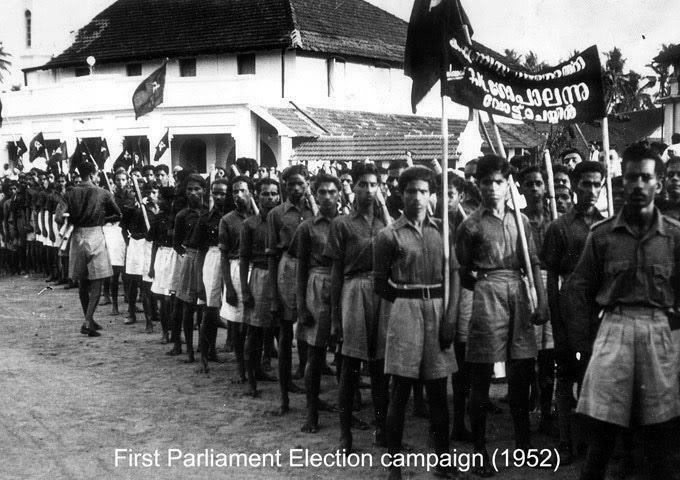 But the rest of India did not go to the polls until January and February 1952. A blind voter assisted at the Jama Masjid. The highest turnout, 80.5 per cent, was recorded in the parliamentary constituency of Kottayam, in present-day Kerala; the lowest, 18.0, was in Shahdol in what is now Madhya Pradesh. Nationwide, about 60 per cent of registered voters exercised their franchise, this despite the high level of illiteracy. A scholar from the London School of Economics described how a young woman in Himachal walked several miles with her frail mother to vote: ‘for a day, at least, she knew she was important’. A Bombay-based weekly marvelled at the high turnout in the forest districts of Orissa, where tribals came to the booths with bows and arrows. One booth in the jungle reported more than 70 per cent voting; but evidently the electoral commissioner Sukumar Sen had got at least some things wrong, for the neighbouring booth was visited only by an elephant and two panthers. 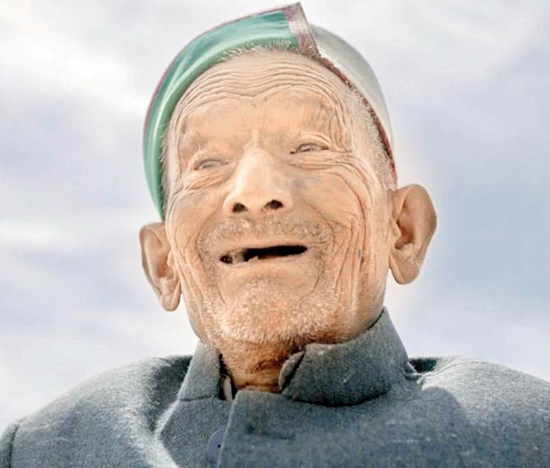 The press highlighted the especially aged: a 110-year-old man in Madurai who came propped up on either side by a great-grandson, a 95-year-old woman in Ambala, deaf and hunchbacked, who still turned up to vote. There was also the 90-year-old Muslim in rural Assam who had to return disappointed after being told by the presiding officer that ‘he could not vote for Nehru’. A nonagenarian in rural Maharashtra cast his vote for the Assembly election, but fell down and died before he could do the same for Parliament. And there was a vindication of Indian democracy in the electoral roll of Hyderabad, where among the first who voted was the Nizam himself. One place in which there was especially brisk polling was Bombay. Delhi was where the rulers lived, but this island metropolis was India’s financial capital. It was also a very politically aware city. Altogether, 900,000 residents of Bombay, or 70 per cent of the city’s electorate, exercised their democratic right on election day. The workers came in far greater numbers as compared to the fashionable middle class. 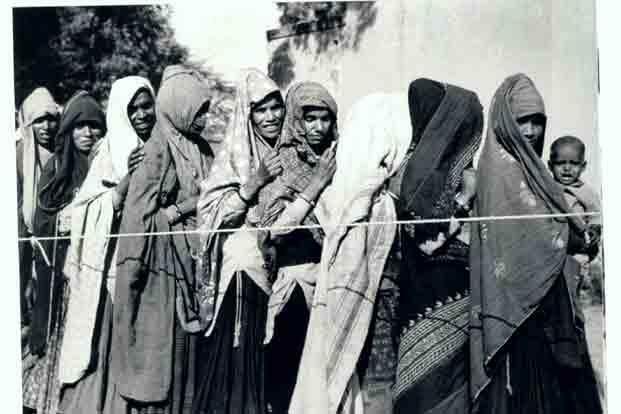 Thus, reported the Times of India, ‘in the industrial areas voters formed long queues long before the polling stations opened, despite the particularly cold and dewy morning. In contrast to this, at the WIAA Club [in Malabar Hill], which housed two polling stations, it appeared as if people straggled in for a game of tennis or bridge and only incidentally to vote’. A villager checking the party symbol of his prefered candidate. The day after Bombay went to the polls it was the turn of the Mizo hills. With regard to both culture and geography there could not have been a greater contrast. 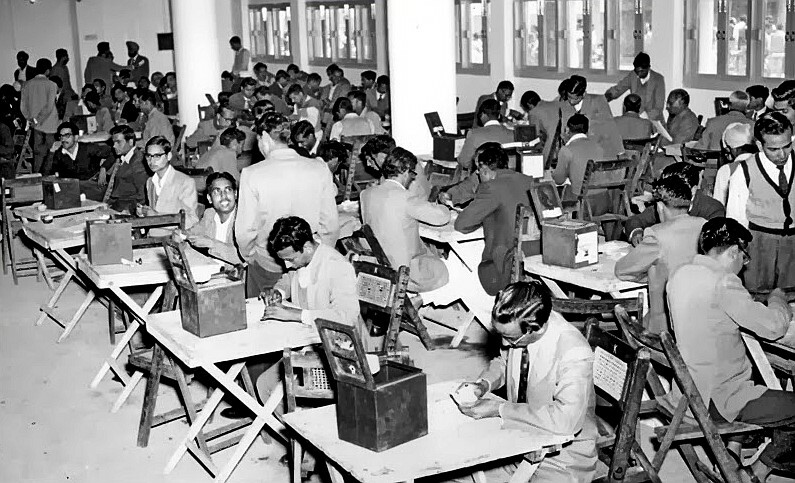 Bombay had a great density of polling stations: 1,349 in all, packed into just 92 square miles; the Mizo, a tribal area bordering East Pakistan and Burma, required a mere 113 booths spread over more than 8,000 square miles of territory. The people who lived in these hills, said one scribe, ‘have not known any queues hit her to except those in battle arrays’. But they had nonetheless ‘taken a strong fancy’ to the exercise, reaching their booths after walking for days on ‘perilous tracks through wild jungles, camping at night on the way amid song and community dances around the fire’. And so 92,000 Mizos, who ‘have through the centuries decided an issue with their arrows and spears, came forward to give their decision for the first time through the medium of the ballot’. An American woman photographer on assignment in Himachal Pradesh was deeply impressed by the commitment shown by the election officials. One official had walked for six days to attend the preparatory workshop organized by the district magistrate; another had ridden four days on a mule. They went back to their distant stations with sewn gunny sacks full of ballot boxes, ballots, party symbols and electoral lists. On election day the photographer chose to watch proceedings at an obscure hill village named Bhuti. Here the polling station was a school-house which had only one door. Since the rules prescribed a different entry and exit, a window had been converted into a door, with improvised steps on either side to allow the elderly and ailing to hop out after voting. At least in this first election, politicians and the public were both (to quote the chief election commissioner) ‘essentially law-abiding and peaceful’. There were only 1,250 election offences reported. These included 817 cases of the ‘impersonation of voters’, 106 attempts to take ballot papers out of a polling station and 100 instances of ‘canvassing within one hundred yards of a polling station’, some of these last offences doubtless committed unknowingly by painted cows. Indeed, many doubted Universal suffrage could work in a land of such high illiteracy. A respected Madras editor complained ‘A very large majority [will] exercise votes for the first time: not many know what the vote is, why they should vote, and whom they should vote for; no wonder the whole adventure is rated as the biggest gamble in history’. Even Nehru, who – unusual for politicians, could see both sides of the question – realized the problem but remained committed to universal suffrage. His doubts disappeared with victory. India has – for all her problems – remained a largely successful democracy. So many other newly formed nations have allowed military to have some say in government resulting in coups. When we consider the allegations of electoral corruption that haunt post colonial societies world over, the success of India’s first General Election stuns the imagination. The irony is that Nehru, when imprisoned by the Bureaucracy in 1935 complained of the “progressive deterioration, moral and intellectual, of the higher services, more especially the Indian Civil Services.” Fifteen years later, Nehru was obliged to place the polls in the hands of men he would once have dismissed as imperialist stooges. This article is a precis of Ramachandan Guhu’s India after Gandhi: The history of the world’s largest democracy 2007, MacMillan, London.